Sammy joined us, from America doing a guest spot back in December. He is now one of our full time time tattooists with over 20 years tattooing experience. 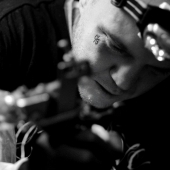 He has mastered of range of styles so is confident in all genres of tattooing. Work to be posteed soon. Please check out The Sharp Practice Facebook Page to see his work.